Via its strategic partner Sea-Tech, Rent-A-Port has extensive experience in the unloading and storage of cement with several projects in France. Via a hands-on and innovative approach, cost efficient solutions have been worked out. 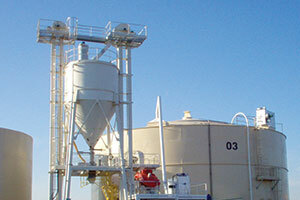 A new design of cement storage in a petroleum tank, connected to a loading hopper offers huge savings compared to the traditional storage in silo’s on piles.